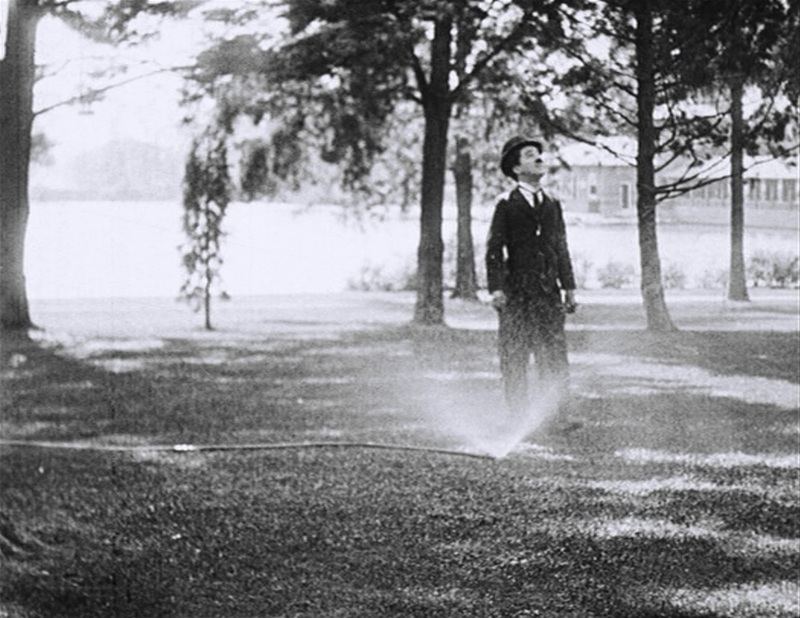 Charlie Chaplin’s classic Keystone formula of “A girl, a park, and a policeman” gets his more sophisticated Essanay treatment, before taking a sudden turn into cross-dressing and gender bending relationships. This may have been one of the movies Sime Silverman thought was “dirty” or “vulgar,” but for slapstick fans, it’s hard to top. This begins with a happy family in the park – father (Charles Inslee), mother (Marta Golden), and grown daughter (Edna Purviance), gently snoozing in the shade of a tree. Mother snores, so father can’t sleep, and thus is awake when a pretty girl (Margie Reiger) walks by and waves. Father pursues her, and she shows an interest, even though he’s clearly married. He goes to get them sodas from a nearby vendor, and along comes the “Little Tramp,” walking over garden hoses and thinking that it’s raining. He takes an interest in the girl, who is as happy with one guy as another. Then the father hits him with a bottle and chases him off. There are more escapades, and for a while the father is blindfolded in a game of “hide and seek,” giving Charlie an opportunity for revenge and to push his adversary into the lake. He then finds Edna and mother and, away from the father, is able to impress them enough to get an invitation back to the home. He does his little “tea party” routine for them and is getting into their good graces when father comes home. He’s ready to put his best foot forward, but Inslee recognizes him and a fight breaks out, during which Charlie’s pants are torn off, revealing typical striped comic long johns. He runs upstairs, looking for clothes, and comes across a dummy in a white dress. A lightbulb goes off over his head. 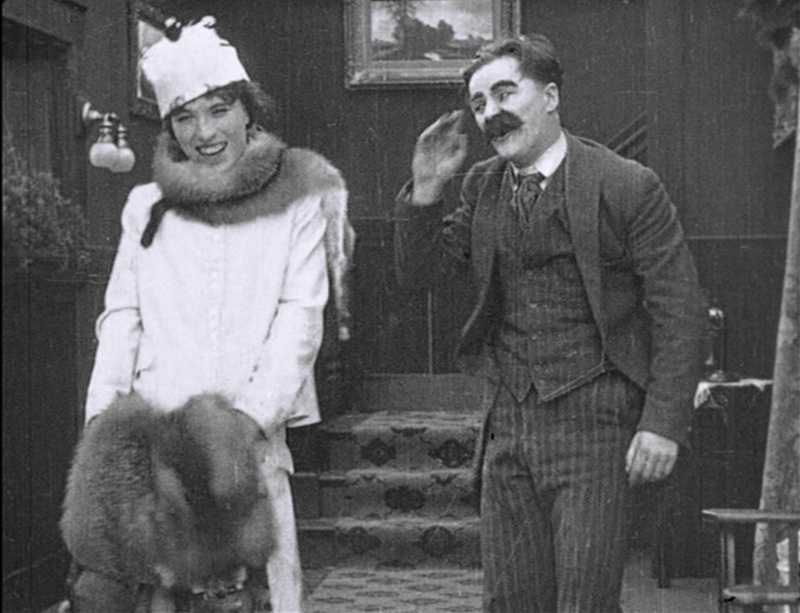 With Edna’s help, Charlie is able to get into the dress and some decent shoes (and shave his famous moustache). He again begins a flirtation with the father and the father’s friend (Billy Armstrong), and tricks the two of them into kissing one another. Finally, the father figures it out, but Chaplin promises to keep everything from his wife in exchange for his blessing to see Edna. It looks like all is well, but Inslee has the last laugh. 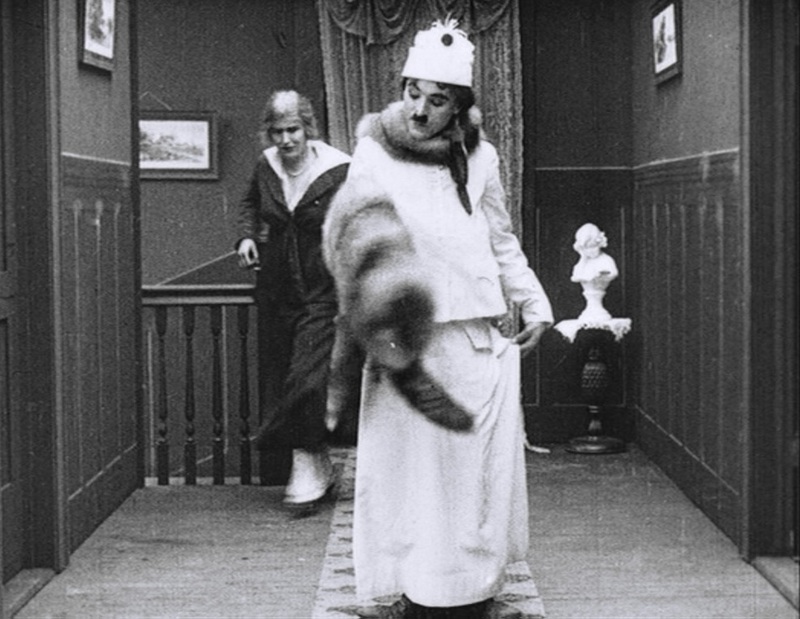 Apparently, this was the last time Chaplin appeared in drag. I’ve talked about one of the other examples in “The Masquerader” and there’s also “A Busy Day,” which I haven’t gotten to, yet. In those terms, I think he did better in “A Masquerader,” where I had to watch twice to figure out that it was him. However, this movie works better overall than that one, in part because Chaplin really does take some time to be sympathetic and lovable, as opposed to just flirtatious and violent. I think this is one of the best “park” sequences I’ve seen – and Chaplin’s character really does show a decided duality between his behavior toward the boorish father versus the pleasant mother and daughter. He’s really only in drag for the final three minutes of the movie, although he does flirt with mistaken-gender identity during the blind-man’s-bluff routine. Other comedians (notably Fatty Arbuckle and Julian Eltinge) got a lot more mileage out of gender-bending than Charlie did, and I don’t get the feeling that he was entirely comfortable with it, but it’s worth seeing him do it to the best of his ability. Technically, this movie is at the standard we’ve come to expect in Essanay comedies of the time. This movie comes about halfway through his contract with Essanay, and like others of the period, makes good use of close-ups, tight editing, and realistic lighting. The action is fast paced and highly reliant on timing, and Charlie pulls off some very nice stunts and good uses of his cane as a weapon or prop.